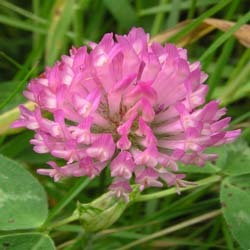 Red clover is also known as trifolium pratense, cow clover, meadow clover, wild clover. It belongs to the legumes family along with beans as well as peas. Trifolium is a type of clover, native to western Asia, Europe, as well as northwest Africa. It is also naturalized and planted in many other areas. It contains compounds called phytoestrogens. They are comparable with female hormone estrogen. Trifolium contains many nutrients including magnesium, phosphorus, vitamin C. niacin, potassium, thiamine, calcium, and chromium. In the past, it has been employed as an ingredient in Home remedies for asthma and used in cough home remedies it is also used to treat bronchitis. Presently it is employed for high cholesterol, osteoporosis, prostate enlargement symptoms, menopausal symptoms, and breast pain. The flowered parts of the trifolium are used to make extracts, which are available in capsules, tablets, teas, as well as liquid forms. Scientific tests show that trifolium contains isoflavones. Isoflavones are plant-based chemicals, which make estrogen-like effects within the body. Isoflavones are potentially useful in treating numerous conditions, which are associated with menopause, like hot flashes, osteoporosis, and cardiovascular health. Studies have shown Trifolium improves blood flow through veins and arteries. However, the study in this area is limited. There have not been any serious side effects reported with trifolium. General side effects might include a rash, headache, and nausea. Women who are pregnant or breastfeed should not take trifolium. Because trifolium has an estrogen-like effect, it should not be taken by women who take birth control pills or on HRT (hormone replacement therapy).